I've begun to think of 2016 as the year of the shelf. Cheers for the year of shelves! We have our entry shelf, over the door. 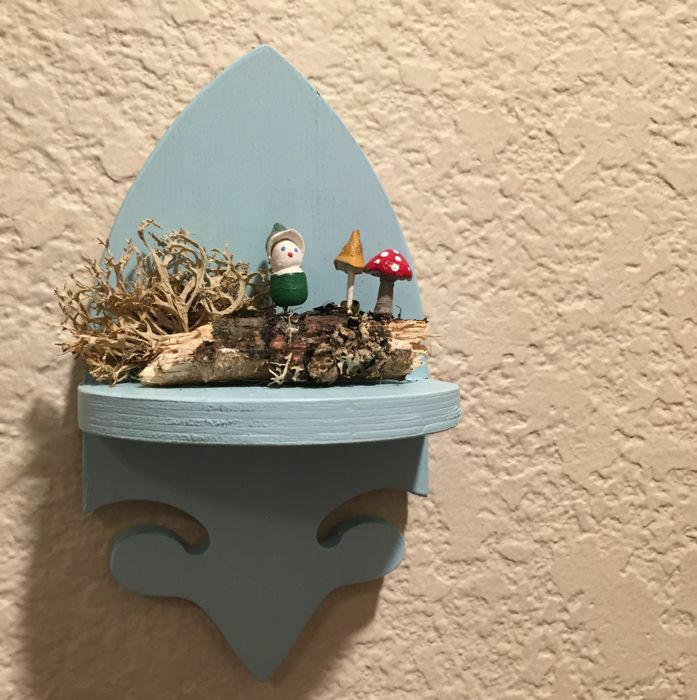 And now, throughout the house, we have the little shelves we built from designs I made. 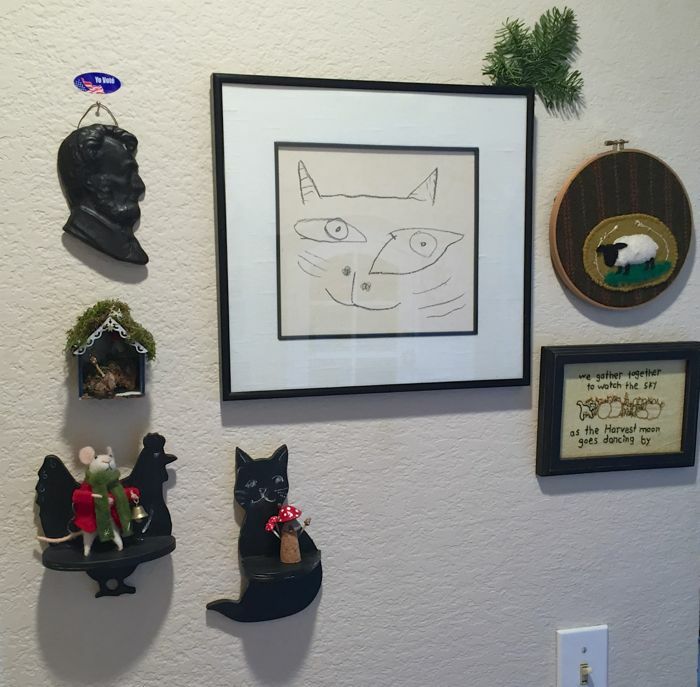 The little shelves, painted and hanging, are displaying tinier things we've made, or collected. 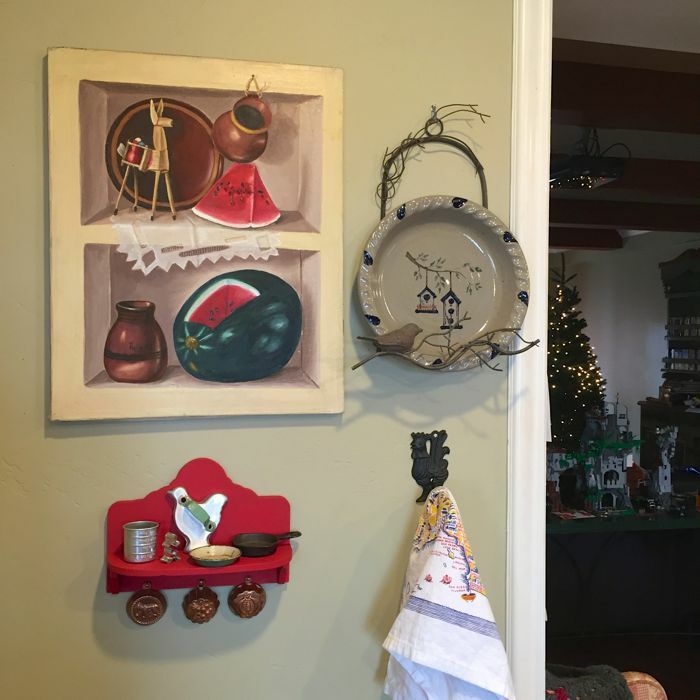 Here, on the dining room wall, are the tiny kitchen tools from the darling curiosity shop on Water Street in Wiscasset, Maine. These two are favorites. Chicken and Cat, painted so they are chalkboards. Maria gave them chalk faces. So dear. That's William's cat drawing, which he did when he was three. 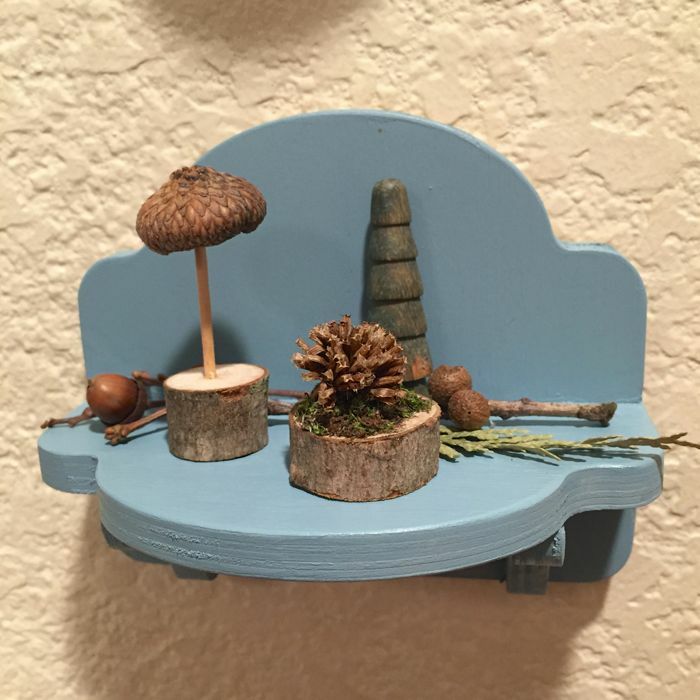 Here is one blue shelf, and the little treasures Maria made with Lauren. And another blue one, with paper clay creations. 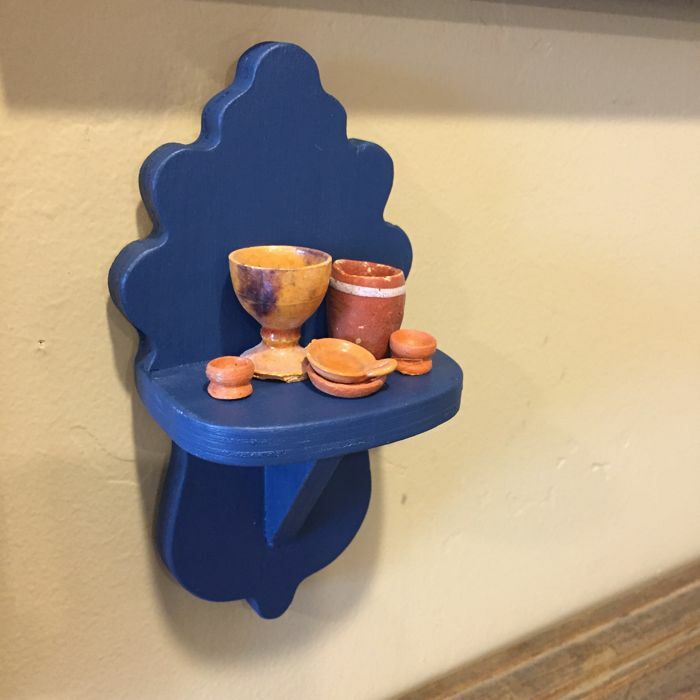 This is a very tiny shelf, with very tiny clay dishes from Mexico. I need more shelves if I am going to bring out my childhood toys from Guadalajara, Esquintla, the Calle Olvera. 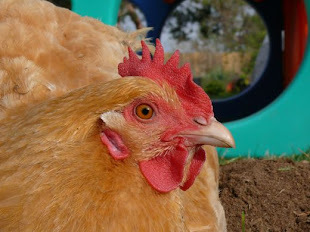 The roo practically flew over to sit on this last shelf, with the painted hen and flowers. I love his self-satisfied expression, and the watchful look of Alex's watercolor rabbit. Really, for me, none of this is quite possible without acknowledging Lauren, and the little shelves she made and displays in her home. I was instantly smitten with those, and came home eager to make some of my own. Thank you, Lauren, for being an inspiration in countless ways. 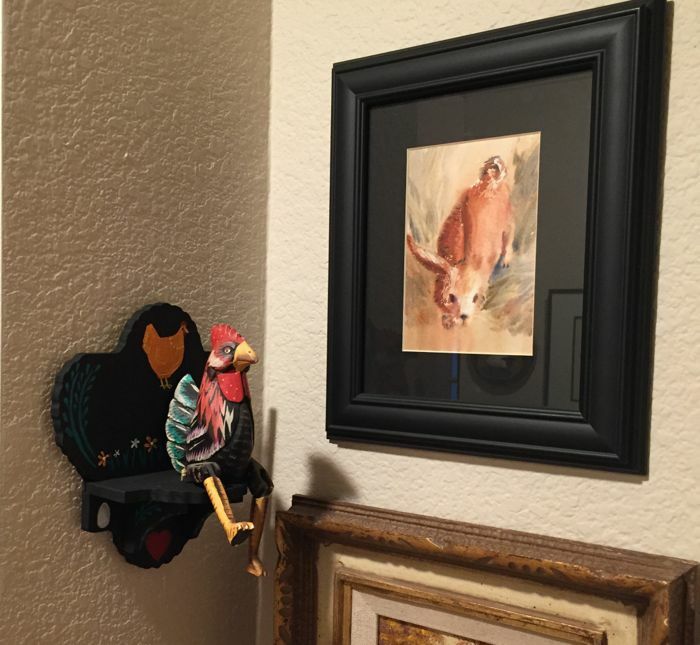 And too, I think of how wonderful it was staying in Jennifer and Ken's home, where all kinds of treasures and beautiful art is hanging, shared, lovingly curated. Funny thing... I felt a bit sheepish about never having stepped into any art museums during our visit to New England, but the truth is I felt like I was seeing great art everywhere, and all the more meaningful and enjoyable for being the art appreciated by friends. I do so very much love that I came back to the Bird House with a determination to recognize and respect the art we have, and we make, and to share it.